Welcome and transfer from the airport to the Hotel in Chiclayo. Night at the Hotel in Chiclayo. Transfer from hotel to the bus terminal of Chiclayo. Trip on bus from Lima to Trujillo (from 08:00 hrs to 11:00 hrs approximately), 4 hours. Transfer from the bus terminal to the Hotel in Trujillo. Night at the Hotel in Trujillo. Lunch at restaurant "El Sombrero", with the show "La Marinera dance" (dance show on Fridays, Saturdays and Sundays). Transfer from hotel to airport in Trujillo. Trip on plane from Lima to Trujillo (1 hour). Night at the Hotel in Lima. Transfer from hotel to bus terminal in Lima. Trip on bus from Lima to Paracas (14:00 hrs - 17:30 hrs). Transfer from the bus terminal to Paracas Harvour. Transfer to the bus terminal in Paracas to Pisco. Trip on bus from Pisco to Nazca (16:00 hrs to 19:00 hrs approximately). Transfer from the terminal to the hotel in Nazca. Night at the Hotel in Nazca. Transfer to the airfield of Nasca. Tour the cemetery of Chauchilla. Transfer to bus terminal in Nazca. Trip on bus from Nazca - Arequipa (14:30 hrs - 23:00 hrs). Welcome and Transfer from the bus terminal to the hotel in Arequipa. Night at the Hotel in Colca. 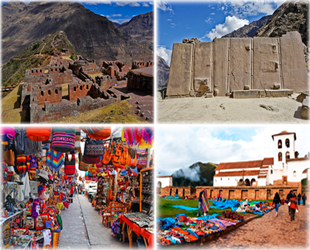 Tour to the Colca Canyon, Cruz del Condor and return to Arequipa. Transfer from hotel to the bus terminal in Arequipa. Welcome and transfer from the terminal to the hotel in Puno. Overnight in selected hotel in Puno. Transfer from hotel to the bus terminal in Puno. Guided tour from Puno to Cusco (All day 08:00 hrs - 18:00 hrs approx). Tour to Sacred Valley (Full day 08:30 hrs. to 19:00 hrs). Tour to Salt mines of Maras Moray 09:00 hrs to 15:00 hrs. Transfer from hotel in Cusco to the airport in Cusco. Transfer from the hotel to Lima airport to return to your country. All transfers: Airport - Hotels - Airport, bus terminal - hotel - bus terminal, railway stations-Hotels - railway stations. Airplane Flight Lima - Cusco (1 hour). 03 nights in selected hotel in Lima including breakfast (as accommodation). Trip onbus from Lima to Trujillo. 03 nights in selected hotel in Trujillo includes breakfast (according to accommodation). 01 Lunch at restaurant "El Sombrero" with live show music Marinera dance (dance show on Fridays, Saturdays and Sundays). Flight Trujillo - Lima (1 hour). 02 nights in selected hotel in Lima including breakfast (as accommodation). 01 night at hotel in Nazca includes breakfast (according to accommodation). Travel by bus from Arequipa to Nazca. 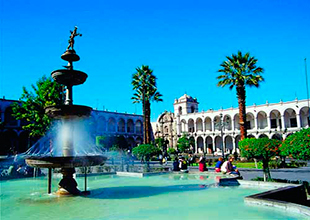 02 nights in selected hotel in Arequipa includes breakfast (according to accommodation). 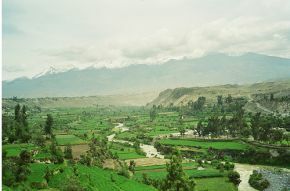 Tour to the Colca Canyon, Cruz del Condor view Condores and return to Arequipa. 01 night at selected hotel in Colca Canyon includes breakfast (according to accommodation). 02 nights in selected hotel in Puno includes breakfast (according to accommodation). 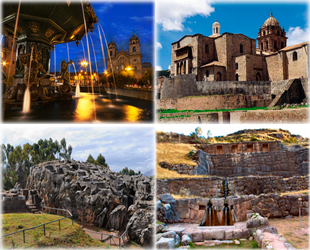 Guided tour of Cusco to Puno (All day 08:00 hrs - 18:00 hrs approx). 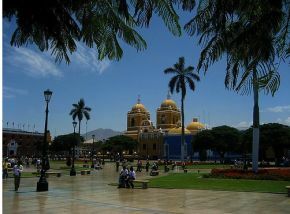 City Tour in Cusco and surroundings (Afternoon 13:30 hrs - 18:30 hrs). 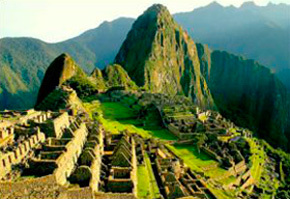 Tour to Sacred Valley (Full day 08:30 hrs to 19:00 hrs). Tour to Maras and Moray. 05 nights in selected hotel in Cusco including breakfast (as accommodation). Flight Cusco - Lima (1 hour). City tour in the "City of Kings" Lima. "Welcome to Lima - Flight to Chiclayo, Welcome to Chiclayo. You should be in Lima's airport at least two hours before the time of the flight to Chiclayo, should approach to the counter of the airline there you can check your tickets by displaying your Id's and take one-hour flight and twenty-five minutes to the city of Chiclayo, where we will welcome you and drive you to the hotel. Tucuman, departure to visit the archaeological site, famous for its pyramids and terraces surrounding the mountain on a radial Magic, traditionally known as Purgatory or Raya. 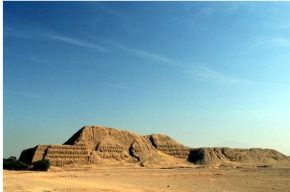 You can see 24 to 26 pyramids that cover an area of 49 km2. The greatest achievement of this culture was developed in fisheries, trade and agricultural activities. 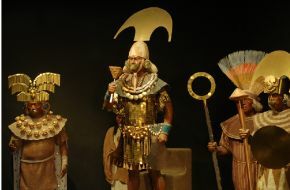 Later we will move to Lambayeque to visit the new and modern Royal Tombs of Sipan Museum has 10 exhibition halls in all the way, where you can appreciate the treasures of the Lord of Sipan and large collection of gold objects, silver and copper, and the treasures of the Lord of Sipan. "Huaca Rajada tour and the Lord of Sipan" Breakfast at the hotel. 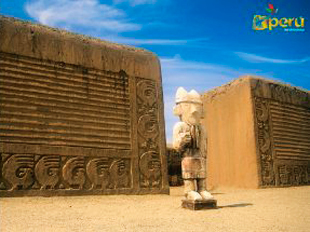 In the morning we go to the archaeological site of Huaca Rajada 33 km east of Chiclayo and 2 kms from the village of Sipan, where they found the intact tomb of an elite character, so it's called THE LORD OF SIPAN (Moche 200 to 700 AD) the magnificence of its ornaments and the high degree of technological development makes goldsmith at work that is considered as the most important archeological discovery of the century. Visit the museum and excavation site exploration. Overnight at the hotel. "Tour of Trujillo." After breakfast at the hotel our staff will transfer you to bus terminal, to take the bus from Chiclayo to Trujillo. Arrival to the city of Trujillo, reception and transfer to hotel. The Perimeter Wall (Baluarte Herrera), La Plazuela Recreation, Archeological Museum, Palace Iturregui, House of Empowerment, The Church Urquiaga Calonge, La Catedral, Casa del Mayorazgo, Plaza Mayor. Tour to Pyramids of the Sun and the Moon " Breakfast at the hotel. In the morning we will make a tour of the Moche Valley, visiting the Countryside Moche, where there are traditional ways of cultivating the land and the typical clothing of the villagers. On this countryside lies the Sun Temple and the Temple of the Moon, wich walls are decorated with beautiful arabesques in high relief with motifs from Mochica Mitology. Overnight at the hotel. 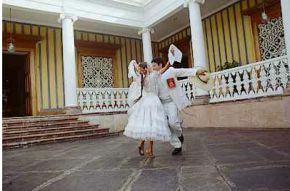 Free Lunch at El Sombrero Restaurant (Typical show dance " Marinera ") Breakfast at the hotel. Free morning and afternoon, we recommend you to visit the craft fair and footwear Trujillo. We will visit the Chan Chan archaeological complex, visiting the temple Huaca Arco Iris, or the Dragon, the Tschudi Palace, one of the nine best-preserved towns, its walls are decorated with friezes in high relief, we will seat their ceremonial worship, reservoirs , granaries, temples or hearings, funerary platform, ending the visit to the cove of fishermen of Huanchaco, a traditional fishing port where you can see the totora horses (ancient craft Mochicas). In the afternoon, we wil drive you from the hotel to the airport to flight back to Lima, in Lima our staff will be waiting at the airport and drive you to hotel for rest. Tour to the "Islas Ballestas and Paracas Reserve" Early in the Morning we pick you up from your Hotel in Lima and take you to the Bus Terminal to start with tthe trip on Bus to Paracas, we will go to the port of Paracas, where the tour start to the Ballestas Islands passing through "The Candle" a huge picture on the side of a hill. Arriving at the Ballestas Islands, we will visit the different islands for two hours, watching the different species of sea lions, seals, penguins and birds. After arriving at the port we will make the tour to the Paracas reserve. In the afternoon we will go to bus terminal in the city of Pisco to take the bus to Nazca the trip usually lasts 3 hours, and our staff in Nazca will be waiting to drive you to your hotel. 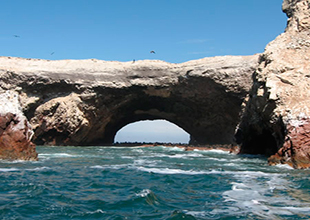 (Photo: Islas Ballestas Paracas). In the morning, having breakfast, we will transfer you to the Nazca airfield to start the adventure of flying over these fascinating figures, for 45 minutes you will enjoy this experience, from where you can see the giant figures of animals and plants, drawn by the pre-Inca cultures with an end not yet discovered, many believe that these figures were made by extraterrestrials, among which are the monkey, the spider, the hummingbird, etc. Then there will be a visit to the "Cementerio de Chauchillas". Then at 2:30 pm you will be transferred to the Nazca bus terminal to make your trip to the city of Arequipa, where on arrival they will be waiting for you to take them to your hotel. (Photo: Spider of the Nazca Lines). Our staff will be waiting for you at the bus terminal in Arequipa, drive you to the hotel where you can rest. In the afternoon we will pick you up from your Hotel starting the City tour in "La Ciudad Blanca" including the Convent of Santa Catalina: A cloistered convent built in 1580 and was enlarged in the 17th century. The over 20,000-square-meter monastery is predominantly of the Mudejar style, and is characterised by the vividly painted walls. There are approximately 20 nuns currently living in the northern corner of the complex; the rest of the monastery is open to the public. 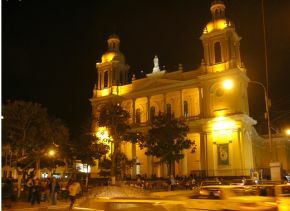 We will also visit Main Square , Compania of Jesus, Cayma and Yanahuara, with a magnificent view of Volcano "El Misti". (Foto: Plaza de Armas de la ciudad de Arequipa.). "Tour to the Colca Canyon Course and Reserve Vicuñas." Early departure towards the highlands passing through Yura-Pampa Catahuas and La Pulpera with good possibility of observing groups of wild vicuñas and fighting cattle. Stop en route to see petrogliphs in the Caves of Mollepunco and in the town of Callali to see natural hill formations with the appearance of enchanted castles. At five in the afternoon arrival in Chivay in the Colca Valley. 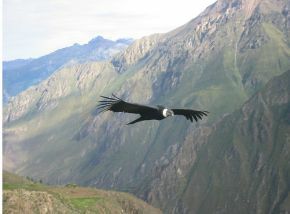 "Tour to the Colca Canyon and a view of the condors." To maximize your probability of seeing condors we depart very early towards the "Cross of the Condor" at about an altitude of 15,000 feet. 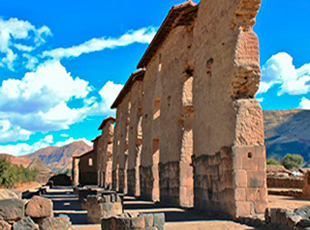 Drive a little further to the canyon to see some pre-Inca ruins and watch the way of life in this remote land. Return to Chivay for lunch in the afternoon return to Arequipa..
"Trip on bus from Arequipa to Puno." We will have almost all the morning whether to rest or have little visits around, in the afternoon We'll go to the Bus Station to travel to Puno, in Puno our staff will be waiting for you and will transfer to the Hotel in Puno, where you'll spend the night to start with our visits early next morning. "Tour of Lake Titicaca, Uros Island and Taquile. Early in the morning you will be picked up from your hotel by our local guide and then transferred to the harbor. We start off our boat excursion of Lake Titicaca by visiting The Uros Floating Islands, a small community that has lived on these reed Islands for decades. Centuries ago the small indigenous Uros tribe conceived of the islands as a way to isolate and protect themselves from rival tribes, the Collas and the Incas. The Uros people harvested the reeds in the shallows of the lake, bundled them together tightly and built floating island platforms complete with reed houses and canoes, creating in this way their own little world. After strolling around the floating Islands, we continue our journey towards Taquile Island (2 hour aprox. ), a traditional Quechua speaking community, full of ancient agricultural terraces and some ruins dating back to the pre-Inca times. The Taquile population was relatively isolated from the mainland until 1950s, and the notion of the community and family is still very strong among them. At the top of the Island, you will have free time to explore this place on your own and afterwards you will meet the group for lunch at one local restaurant. After lunch, we will descent to the harbor to take our boat back to Puno. We will be back in Puno by 17:00 h. approximately. "Tour from Puno to Cusco, visiting Raqchi" After breakfast, we will drive you to the bus station to start with our trip to Cusco this tour lasts around 8 hours you will have 4 guided visits, Andahuaylillas's temple or South American Sixtine Chapel , the Inka temple of Raqchi, Buffet lunch in Sicuani,La Raya at 4335 m.a.s.l and the Inka Aymara museum of Pukara. Every visit has a duration of 20 or 40 minutes, where the passenger will be able to make questions, take photos and walk a for a while, doing our trip very pleasant .Then we will arrive in Cusco, and our staff will drive you to the Hotel. Tour to the Sacred Valley of the Incas. " This tour starts around 9 am., we pick you up from your Hotel, we have a guided tour to the Sacred Valley of the Incas, over the Vilcanota river, with a panoramic view of Pisac an old Inca City and a visit to the Inka market in this village, where we will have the chance to know in a closer way its people customs and get good bargains with the handycrafts and souvenirs sellers, afterwards we'll head for Urubamba, traveling on the borders of the river Vilcanota. 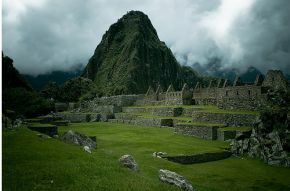 Eighteenth day: Free day in Machu Picchu "The Lost City of the Incas"
After enjoying breakfast in the hotel, we'll pick you up at 8:00 hrs in our mobility, to go to the town of Maras and make a colorful journey, through towns and beautiful scenery so we can enjoy in our tour, first visit the town of Maras, from there you can appreciate the range and Vilcanota snowy peaks as "El Chicon" and "Veronica." Today, this village guard attractive from the pre-Hispanic, colonial and republican, then visit the Moray Archeological Complex located 7 kilometers southwest of Maras; are a set of enormous terraces that overlap concentrically in a giant pit, these beautiful terraces in the Inca served as an agricultural laboratory "Greenhouse Prototype." Finally we will visit the Salt located northwest of the town of Maras are comprised of about 2000 small wells with an average area of about 5 meters, operated from the Inca, Colonial Period and which remains even exploited by the locals. After our visit we return to Cusco. Transfer to Lima Airport and Farewell. After having breakfast we will drive you to the airport in Lima. We should be two hours early for international flight and pay the taxes.